Under Narendra Modi, the Bharatiya Janata Party's two main tenets are clear: neoliberal orthodoxy and violent Hindu nationalism. Narendra Modi’s face is everywhere. On billboards. In full-page newspaper advertisements. Inside the trains of the Delhi Metro. On TV, both in thirty-second spots and breathless news reports. On ghoulish mass-produced masks worn by his supporters. 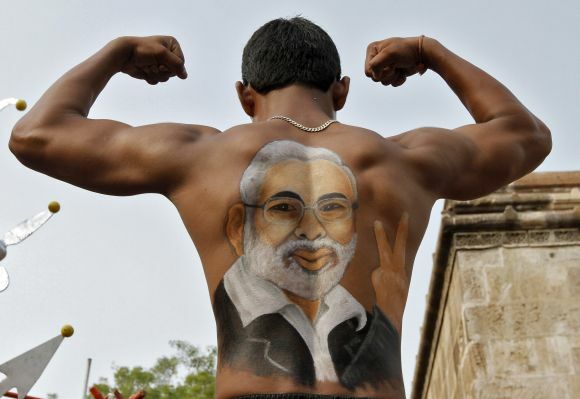 As the national elections roll on in India, Modi is inescapable. Modi, currently the Chief Minister of the state of Gujarat, is the prime ministerial candidate of the Bharatiya Janata Party (BJP), one of the country’s two major national parties. Currently in opposition, the BJP is widely expected to win a plurality of seats in the elections by riding the supposed “wave” of Modi’s popularity and exploiting the widespread dissatisfaction with the ruling Indian National Congress-led coalition. Of course, Congress has lots of ads too, many of which feature the face of Rahul Gandhi, the party’s choice for prime minister. But Gandhi is often joined by others in these ads. Modi, on the other hand, is typically alone, the sole face of the BJP. He is not only the most powerful figure in the party, he is also a perfect distillation of the two main features of today’s BJP: an embrace of neoliberal orthodoxy, and a violent, exclusive Hindu nationalism. The media has made much of the Modi/Gandhi face-off. This is a bit odd, since they are not actually running against each other. After all, India has a parliamentary system, not a presidential one — the people do not directly elect the prime minister. And studies have shown that the vast majority of voters care more about local issues than prime ministerial candidates. In part, the focus on potential prime ministers can be seen simply as a media phenomenon. It’s easier — and more lucrative — for news organizations to focus on the head-to-head clash of two famous politicians, even if this clash does not really exist in concrete electoral terms. Local issues may decide the elections, but they don’t make for good copy. However, even if this is largely a media-created framing of the elections, it has been enthusiastically encouraged by the BJP, which is nothing if not media savvy. Modi in particular has embraced the power of propaganda. His state government in Gujarat hired an American PR firm and paid them millions of rupees (from state coffers) to propagandize the success of the so-called “Gujarat model” of development. The charade was exposed in Open , a weekly magazine, before two key editors were forced out and replaced with ones more amenable to the BJP. Making full use of the pliable media, the BJP has aggressively positioned itself as, simultaneously, the party of Modi and the party of the masses. Those unnerving Modi masks are meant to show that the people of India are literally one with Modi. He does have widespread support. But Modi also evokes more enmity than any other politician in India, even within his own party. Both Modi’s supporters and detractors agree that he is strong-willed and brooks no opposition. At each stage in his rise, he has consolidated power while leaving disillusioned colleagues in his wake. But Modi boosters maintain that, in these uncertain times, the country needs a leader who is resolute, decisive and uncompromising. His opponents would likely reach for other adjectives: authoritarian, ruthless, fascist. The influential psychologist Ashish Nandy spoke of an early interview with Modi, before he was a nationally-known figure. Here was a classic, clinical case of a fascist. I never use the term ‘fascist’ as a term of abuse; to me it is a diagnostic category . . . Modi, it gives me no pleasure to tell the readers, met virtually all the criteria that psychiatrists, psychoanalysts and psychologists had set up after years of empirical work on the authoritarian personality. Recently, some liberal commentators have suggested that the “fascist” label is excessive. These suggestions are often part of a push to excuse the past horrors of the BJP regime (now portrayed as early missteps of an immature party) and to suggest that, against the left-liberal consensus, maybe Modi isn’t that bad after all. Modi is that bad. There are myriad reasons to see him as embodying fascistic tendencies: his rabid nationalism; his constant demonization of the Other (in this case represented by Muslims and Pakistan); his hyper-masculinity (he infamously suggested that a sufficiently tough leader needs a fifty-six-inch chest); and, above all, his violent, repressive reign in Gujarat. But even within the Left, there is disagreement about whether “fascist” is really the best way to characterize the BJP. (The Indian Right has wisely learned to distance itself from this term and to backpedal on its earlier praise for Hitler.) Achin Vanaik, a professor of political science, has argued that the brand of Hindu nationalism embraced by the BJP does not really match the Marxist conception of fascism, which emphasizes the larger socioeconomic factors that led to fascism’s rise: a severe crisis of capitalism, especially among imperial states; a strong, threatening workers’ movement; and a relatively weak bourgeoisie that was willing to temporarily cede political power to a strong fascist state. Since these factors are absent in India, Vanaik sees the BJP as embodying, not fascism, but “reactionary authoritarian populism,” born out of disillusionment with failed modernization. This characterization has the benefit of tying the BJP phenomenon to other reactionary trends that have spread throughout the world in the past thirty years, including religious fundamentalism, Buddhist nationalism, irredentist nationalism, and racist xenophobia. The term “fascist” thus may be useful in highlighting the threat that the BJP represents (even Vanaik concedes this point), but it hardly illuminates the complex set of social, religious and economic factors that have enabled the party’s flourishing. Perhaps that is too much to expect of a single adjective. Yet those complexities must be understood if one wants to counter the BJP’s combination of neoliberal orthodoxy and violent religious fervor. An outstanding guide to this complex terrain is a lengthy article entitled “Neoliberalism and Hindutva — Fascism, Free Markets and the Restructuring of Indian Capitalism,” by Shankar Gopalakrishnan (who also, apparently, can’t resist the “fascist” label). As Gopalakrishnan notes, these two ideologies, neoliberalism, and Hindutva, have different histories and trajectories, but their union in the guise of the present-day BJP has a certain logic. Hindutva, with its origins in the early days of British colonialism, has a more established presence in India. The colonial period saw the emergence, not just of Hindu nationalism, but of Hinduism as we know it today. Largely in response to Christian conceptions of religion (with their emphasis on holy texts and fixed doctrines), a bewildering variety of Indian religious traditions were grouped into a unified whole: Hinduism. Along with the consolidation of the religion, there were also vigorous attempts to renew and redefine religious traditions, often in the face of British criticism. These efforts sometimes took the guise of progressive reform. But renewal also had its more conservative manifestations, chief among them Hindutva, or the idea of India as an essentially Hindu nation. In this view, India had been Hindu since time immemorial, and the edicts laid down by the ancient sages represented the core of Indian civilization (never mind the centuries of flourishing Muslim traditions or the varied belief systems of thousands of different indigenous communities). The most influential Hindutva group in India today is the Rashtriya Swayamsevak Sangh (RSS) or “National Volunteer Organization.” Founded in 1925, the RSS has built a nation-wide network of well-organized cadres deeply committed to the ideology of Hindu nationalism, and prepared to use violence and intimidation to achieve its goals. Modi got his start as a RSS pracharak or full-time activist. As he climbed to the higher rungs of RSS leadership, he served as the liaison between the RSS and the BJP on both the state and the national level. He is by far the most prominent politician to emerge from the RSS. But the alliance between the RSS and the BJP has not always been so straightforward. The predecessor of the BJP, a party called the Jana Sangh, struggled to define its relationship with the RSS. As a political party, it needed to get votes from a wide cross-section of the population, and the RSS’s particular brand of divisive, militant Hinduism was thought to be too controversial for open endorsement. Though initially quite close to the RSS, the party sought to moderate its position in the early 1980s, when it officially became the BJP. After a spectacular failure in the 1984 elections, the party swung heavily to the right, embracing Hindutva more openly, and benefiting greatly from the vacuum left by the flailing Congress party and wider disillusionment with the failures of post-independence development. The defining moment of the BJP’s rise came in 1992, with the destruction of Babri Masjid. This mosque, Hindutva leaders claimed, was built on the rubble of a temple that had been demolished by Muslim conquerors centuries earlier. Fundamentalist forces led a massive movement calling for the mosque’s destruction, citing local traditions to bolster its assertion that this was the birthplace of the god Rama. BJP leaders took an active role, organizing a tour through India in a Toyota van dressed up as an ancient chariot, and leaving riots and bloodshed in their wake. Congress, which was relying on BJP support to keep its shaky government in power, did little to stop them, at one point even unlocking the mosque doors so Hindus could pray there. In the end, Hindutva mobs destroyed the mosque, leading to another round of communal violence. How was the BJP/RSS combine able to build up such mass support for this issue? Before this, the BJP was largely known as a party of brahmins and banias; that is, upper-caste Hindus, many of whom were small traders and businessmen, and who formed a tiny slice of India’s total population. But the Babri Masjid mobilization turned the BJP into a party with a truly mass base, as seen in the dramatic reversal of its electoral fortunes: from winning a mere two seats in national elections in 1984 to winning 161 in 1996. Gopalakrishnan identifies two major factors in the BJP’s transformation. First, they used the language of marketing to promote religious belonging and community action through consumption on a national scale. This included mass production of items like stickers, tridents, clothes and pictures. Second, and more fundamentally, they were able to gain the support of those who were most adrift in the Indian polity, the victims of India’s failed development and its rapid shift towards economic liberalization. This must be seen in the context of the powerful social movements that swept through India in the 1980s, and that competed with the Hindutva forces to fill the gap left by a declining Congress Party. These movements took many forms, but the most powerful of them were led by newly-wealthy farming communities, and were able to incorporate in their fold poorer peasants and agricultural laborers as well. These movements often emphasized regional or caste identity, and thus were able to cut across classes. For many of the movements, a key demand was higher agricultural prices, and they lobbied, often successfully, for subsidies and policies that insulated the sector from international competition. Of the many thousands that participated in the Babri Masjid mobilization, the majority came from cities or the urban periphery, and were overwhelmingly poor. These were precisely the groups that did not benefit from the new movements of the 1980s, and who were most vulnerable to the shifts in India’s political economy. The BJP/RSS combine did not just offer psychological benefits, in the form of a sense of belonging and a vent for their anger. It also provided concrete material benefits, including educational opportunities, health care, job opportunities and so on — provided that they were “good Hindus” who didn’t raise a fuss about issues like caste and gender inequality. So, for example, women were often given unprecedented opportunities to meet in public and to support political causes, but they were strongly discouraged from making explicitly feminist demands. Such demands would rebel against the raison d’etre of Hindutva: to build a strong, internally undifferentiated Hindu community that is defined by its unity and strength in the face of the Other. In Hindutva ideology, there is also little recognition of oppressive structures like patriarchy or the caste system. Rather, if there are evils in the world, they are the result of individual flaws, and can be addressed by inculcating those at fault with “correct” values. This suggests the ideological similarities between Hindutva and neoliberalism. Both were fundamentally opposed to the 1980s social movements, which employed the logic of competing groups divided along regional, caste and occupational lines. While Hindutva seeks an individuated but united Hindu social body, neoliberalism seeks atomized individuals relating on one-on-one terms with the market. Gopalakrishnan, who sketches these similarities so persuasively, also emphasizes that the comparison shouldn’t be taken too far; the ideologies have stark differences as well, not least in their conceptions of freedom and morality. For the moment, the alliance between Hindutva and neoliberalism is building momentum, as suggested by Modi’s rise. His reign in Gujarat gives a terrifying vision of what a Modi government might mean at a national level. On the Hindutva front, Modi was in power during the 2002 riots in Gujarat, which saw horrific violence against the state’s Muslim community. Modi supporters argue that he has never been convicted of any crimes, so he must be innocent of any wrongdoing, despite strong evidence to the contrary. The government investigation that ostensibly established his innocence was ridden with inconsistencies and errors, and Modi — whatever his personal role — has continued to give strong support to leaders of the pogrom. Less known, an equally shocking element of Modi’s Hindutva past is his relationship with Swami Aseemanand, the mastermind behind several terrorist bomb blasts, whose main calling was converting indigenous people to Hinduism, often by force. A recent profile of Aseemanand, which contains stunning revelations about his extensive ties with BJP and RSS stalwarts, met with deafening silence from the corporate-controlled media, another implicit sign of bourgeois support for the BJP. But this is the minor key of the BJP campaign; the major focus is the supposedly miraculous Gujarat model for development, proof of Modi’s successful neoliberal governance. Any sustained examination of this model, though, shows the hollowness of its claims. Capitalists are not supporting Modi because he is more efficient or transparent than Congress leaders, and certainly not because he has promoted inclusive development. Rather, they recognize that Congress has failed in fully implementing their policy preferences, as it is still somewhat beholden to the logic of the 1980s social movements and to providing a bare minimum of social welfare measures. To the titans of industry, Modi is the best remaining option. In the coming elections, the key question is this: will the BJP be able to move beyond its powerful but numerically insignificant brahmin-bania-bourgeoisie support base? After its wildly successful mobilization of the urban and semi-urban poor for the Babri Masjid campaign, the BJP has struggled to retain popular support. The party’s unexpected defeat in the 2004 elections suggests that its wholehearted embrace of neoliberal policies has alienated it from its former base. The party is now depending on the backing of the growing and increasingly aspirational lower-middle class, which has seen the rising levels of wealth around them and believes that it too can enjoy the fruits of neoliberal India. But these are bitter fruits. Combine the false promises of neoliberalism with the violent, strident nationalism of Hindutva: this is a formula for polarization. But the BJP is hoping that, in the already fragmented world of Indian coalition politics, they can divide and conquer their way back to power. Perhaps then the Modi mask will allow itself a crooked smile. Under Narendra Modi, the Bharatiya Janata Party’s two main tenets are clear: neoliberal orthodoxy and violent Hindu nationalism.